Willard’s classic work may have been The Spirit of the Disciplines, which examines the role of the disciplines in spiritual transformation. The Divine Conspiracy is another book for which he is well-known. I will forever associate this book with a personal retreat I took. It was during that retreat that I wrestled with the question of how to integrated the kingdom of God with everyday living. The Divine Conspiracy both prompted those questions and served as a guidebook through my retreat. I just recently enjoyed flipping through it again and discussing it with my brother when he asked for a Dallas Willard book I would recommend. One of the first topics I wrote about here was on Willard’s book The Great Omission. Willard did not hesitate to challenge the church where he saw gaps in theology. He wanted the believer to always experience more in their relationship with God. The other book I have read by Willard is Hearing God. Willard’s spiritual, yet intellectual approach to faith will be missed! 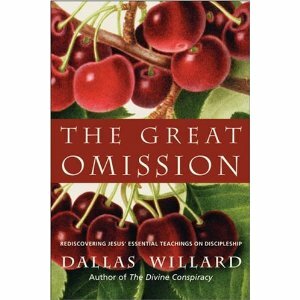 I just finished reading The Great Omission by Dallas Willard. I have to say, when I began reading it and found that it was largely a collection of previously written articles, my first reaction was disappointment: “Nothing new here that I haven’t already read by Willard.” But I was pleasantly surprised and enjoyed the book very much. As I often point out to folks, today we are not only saved by grace, we are paralyzed by it. Grace is not opposed to effort, it is opposed to earning. I can only imagine that a statement like that does not sit well with most Evangelicals. Willard often had to defend that statement, explaining that, yes, we are saved by grace, but becoming a disciple of Jesus requires effort and discipline. And because effort sounds a little too much like works, many churches simply avoid the issue of discipleship altogether. It doesn’t preach well. The result has been churches full of Christians, yet wanting in disciples. Paralysis! Perhaps that quote has stuck with me because it aptly describes my own spiritual journey. Early on, my faith consisted primarily of trying to keep the rules. It was exhausting. Over time, all the teaching on grace began to sink in. I learned to relax, to get off the performance treadmill. But over the last five or so years, there has been a restlessness to my faith. There was still something missing. I am discovering that the missing piece is the disciplined life of a disciple. And it is not easy; nor is it something that I will just drift into. It requires effort. And that aspect of faith isn’t spoken of much in the church. It’s much easier to just stick with the subject of grace. So is there such a thing as too much grace? How does Dallas Willard’s statement sit with you? How do we convey both the grace of God and the discipline it takes to be a follower of Jesus? There is absolutely no suggestion in the New Testament that being a disciple consists of reading your Bible and praying regularly. There is a totally wrong conception of what discipleship is. It’s been presented as attending a church, reading your Bible, praying, and maybe some witnessing, and that’s it. [Many think], “I will make discipleship these ‘devotional’ times.” They would be opposed to saying, “My life is my discipleship.” Or, rather, they just wouldn’t know what that meant. My life is my discipleship. Do you ever read a simple statement over and over again, struggling with the feeling that you don’t fully get it? I just kept reading that statement. Discipleship is something I’ve been trying to understand for a couple years now. It has been during this time of transition in my life that I have been trying to incorporate more of the spiritual disciplines. But I have to confess, it has not always been clear to me how the disciplines, discipleship, the kingdom of God, and my life all fit together. I am slowly learning that the disciplines, in and of themselves, are not discipleship, though they may be a piece of it. Discipleship, in part, is how I let those disciplines inundate the rest of my life. My life is my discipleship. I am realizing that it is all too easy to confuse accomplishment with discipleship. Dare I say that the drive to accomplish may be the enemy of discipleship. It is also easy to mistake devotional time with discipleship, as Willard points out. But devotional times are powerless unless we express that devotion throughout the rest of our day. God never intended us to possess such a compartmentalized faith. So it would be easy for me to finish my coffee, feel encouraged about my reading, blog about my morning, and think, “what a great time of discipleship.” But in truth my discipleship time begins when I leave Starbucks – as I drive back to the house, as I watch football this afternoon, as I take the dog for a walk, as I pay more attention to the people who cross my path today. I become a disciple of Jesus, not when I read about him in an overstuffed chair in a coffee shop, but as I follow him out the door into the rest of my day.